Fearing a complete meltdown of stock prices at Karachi Stock Exchange, Pakistan's Securities and Exchange Commission imposed a floor of 9144 for the market's benchmark KSE-100 index. The index closed at 9144 level on Wednesday, Aug 27, the day the KSE and SEC announced their decision to not allow the KSE-100 to trade below this arbitrary level. This extraordinary action, the first of its kind since the exchange opened its doors in 1948, came after investors pushed down the index to its lowest level in more than two years. Karachi stock exchange saw very thin trading on Friday and the KSE-100 index finally closed at 9,208.26 points, with a meager gain of 4.48 points. 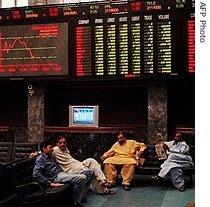 The KSE-30 index increased by 15.87 to close at 10,198.05 level. The KSE-100 has lost 34.6% of its value this year, as investor confidence has been been hurt by political uncertainty and a long list of economic troubles, including skyrocketing inflation, disappearing foreign exchange reserves, declining rupee and a soaring deficit. Putting it in perspective, India's Sensex is down 48%, Shanghai has lost 44 percent, Russia is down 25 percent, and Brazil, 36 percent. "One thing that is badly missing in Pakistan is investor confidence," said analysts at JS Global in a research report on Thursday. "The global financial crunch, rising commodity prices and [the] local political situation has affected the macroeconomic picture," they said. "And that is reflected in the stock, money and currency markets." Pakistan's currency, the rupee, has fallen about 16% in the last four months. Prior market stabilization measures introduced by Karachi Stock Exchange in June included tighter circuit breakers on the downside and a complete ban on short selling. However, when these measures were reversed in July, the market continued its downward slide because the fundamentals further deteriorated. The latest media reports indicate that the Pakistani stock-market regulator will review the freeze imposed on the market within the next 12 days. It is almost certain the market will continue to slide as soon as the freeze is lifted, unless political stability and economic fundamentals show any signs of clear improvement.